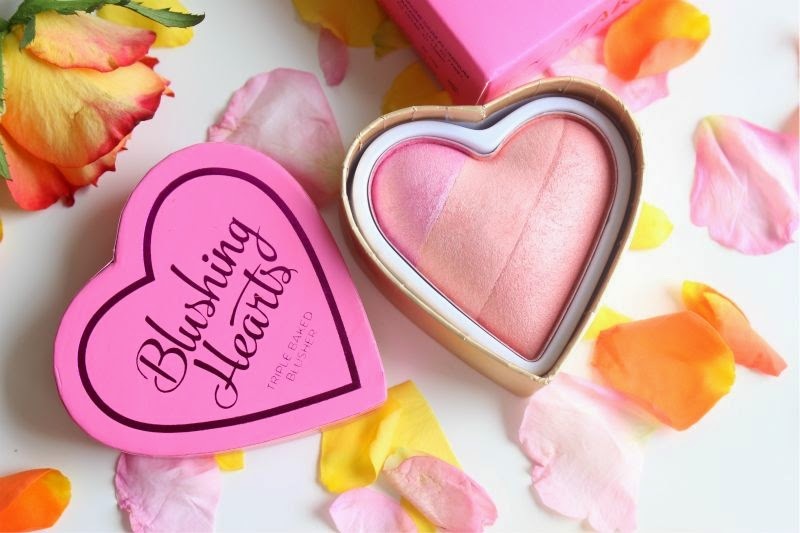 The new range of I Heart Make Up Blushing Hearts Triple Baked Blushes will of course draw comparisons to the Too Faced Sweetheart Blushes, large heart shaped packaging, that is beyond pretty complete with a striped baked blush inside. Yes they are nearly identical but the prices and shade ranges are not. The I Heart Make Up Blushing Hearts Triple Baked Blush cost a mere £4.99 and come in six shades (I plan to collect them all). 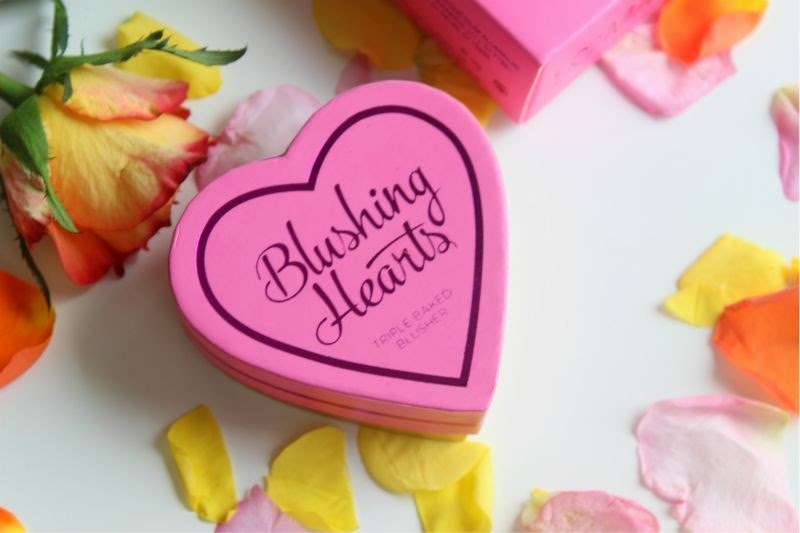 The I Heart Make Up Blushing Hearts Triple Baked Blushes feature pink, reinforced cardboard packaging that should be able to take a knock or two not to mention they will look rather wonderful displayed on a dresser. Shallow moi? Never. Admittedly I do think the heart shape design is a little bulky to be carting around in my handbag but I am a fan in all other aspects. 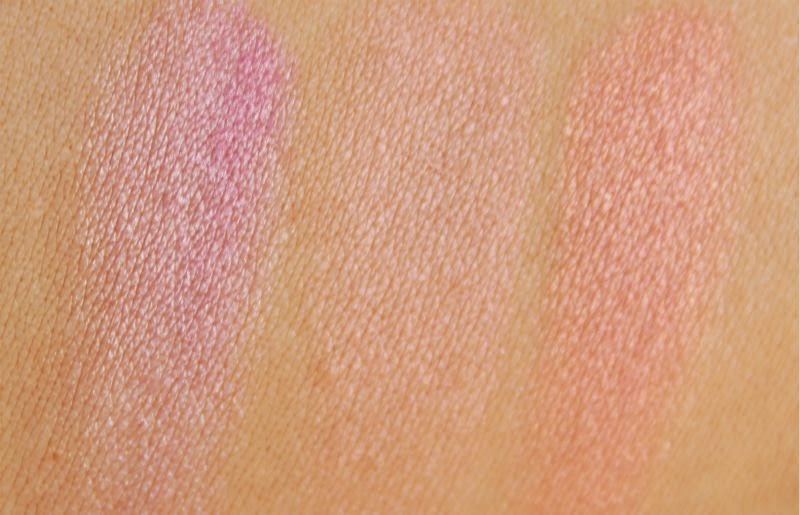 As mentioned there is six shades within the I Heart Make Up Blushing Hearts Triple Baked Blush range, I have the slightly more coral pink trio that is Candy Queen of Hearts. This blush features a stripe of mid toned, blue pink, a bright yet light orange coral that can double up as a highlighter and lastly a slightly ruddy muted coral. The idea is that you can wear all three shades solo (the stripes are more than sizeable enough to allow you do so) or of course swirl all three hues together to form a light, coral come shell pink which is not worlds apart from MAC Stereo Rose MSF. 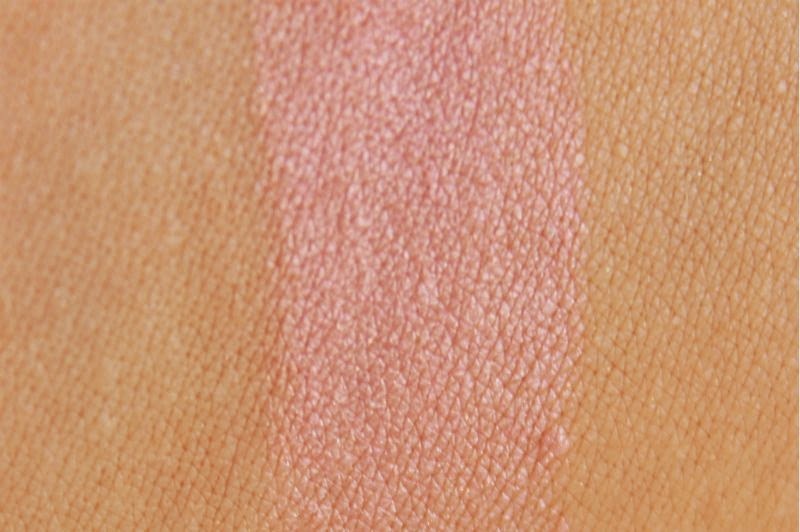 In my opinion this particular trio of shades (Candy Queen of Hearts) is best suited as a blush for those with a light to medium complexion, on deeper skin tones this will be more of a highlight than flush of colour. The good news is that it isn't stark so it should be flattering on deep complexions albeit in a different sense. 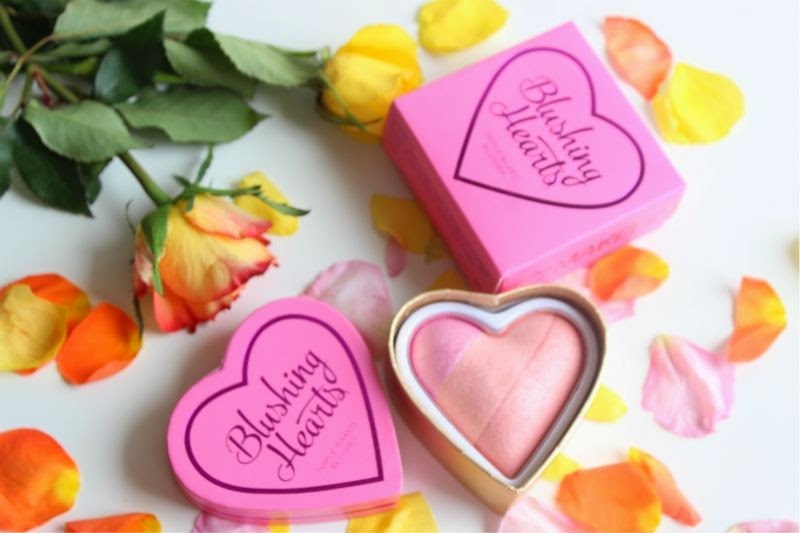 Despite being a shimmer based blush this is an entirely flattering formulation - the shimmer particles within the I Heart Make Up Blushing Hearts Triple Baked Blush in Candy Queen of Hearts are so fine that they do not sit in enlarged pores nor do they highlight any other imperfections. 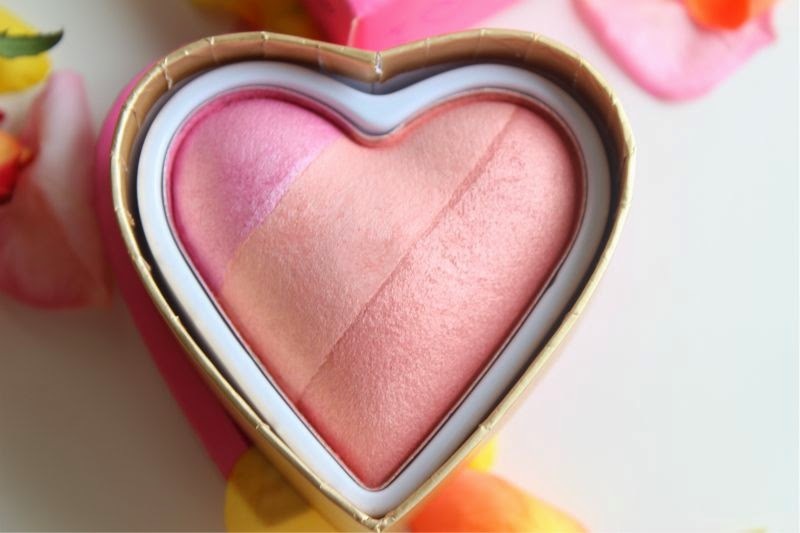 Candy Queen of Hearts delivers a light flush of colour to the cheeks as well as giving the illusion of radiance - a healthy glow if you will. It is worth mentioning that this is not the most pigmented blush out there but it does have a good level of colour pay off, the texture is soft and silken but a little dry meaning it does produce a little fall out. To apply I find using a large soft, fluffy brush the best way to apply this formula/texture. I have only worn this blush once but can state that even in last nights humidity this stayed put a solid eight hours before my oily skin took over. For change of a fiver it really is a great little purchase. 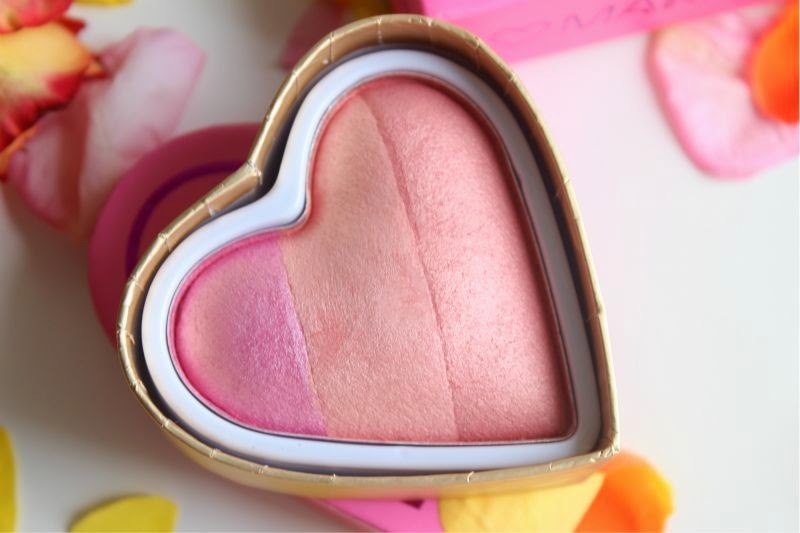 You can fins the entire range of I Heart Make Up Blushing Hearts Triple Baked Blushes here - link for £4.99 each.